Excellent power delivery and control in harsh conditions with immense top end. Drifts well in the surf and has crazy lift and hang time. Popular with foilers. Kiteworld Magazine says so: The T5 kite has a tremendous balance between boosting performance with control and comfort. Forgiving the more robust handling needed to release the chicken-loop, the ride experience of this kite in blustery conditions made it one of our favorite freeride kites on test. 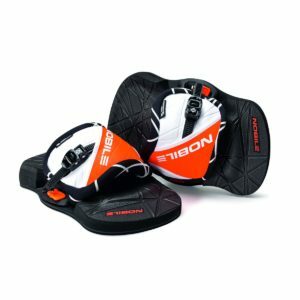 No flapping, no noise, just high-fidelity kitesurfing and clean feelings of control. Like listening to your favourite music through really good headphones. There’s a constant pull and even in the big gusts the T5 just swallows it all up and you’re able to just feather the bar gently in and out to maintain board control. 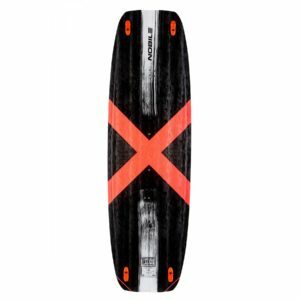 When it comes to jumping that extraordinary element of control means that even if you have huge amounts of power on tap loaded into the kite, your board speed and control remains very manageable, allowing you to approach your take-off in full control rather than skipping out. 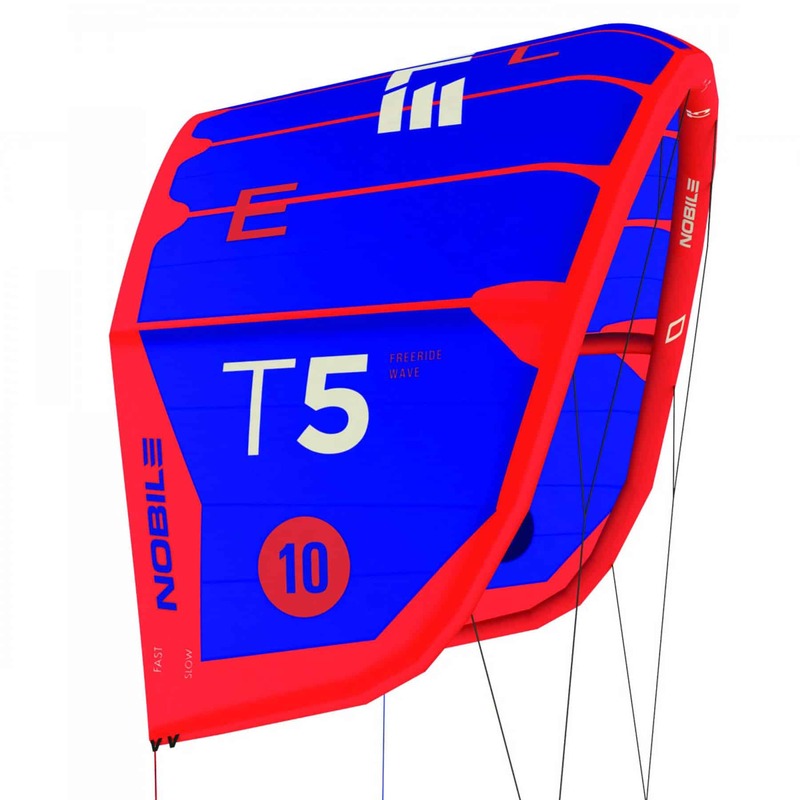 When you send the kite overhead and pull the trigger the T5 is pure class. It’s like, ‘Oh, you want to jump sir, well let’s go then.’ It starts climbing from the moment you send it. Shortly after take-off it’s like the kite latches onto extra lift that’s otherwise unavailable, like when a rollercoaster clicks into gear as it climbs uphill, but this is much smoother. There’s no clunking through the gears, you just go up, up, up and then you’re like ‘Oh, I’m still going up!’ The flight path is also so consistent with the hangtime being nicely proportioned with the height. You get time to really enjoy the flight because there’s total comfort from the sense that you’re being well looked after. TEST TEAM NOTES: The bar bag had a tab that said ’23 metre lines plus 3 metre extensions’. Aware of this it then felt a bit old school to be unwinding relatively long lines, but Bully was frothing at the prospect. He’s been kiting for almost longer than WKL World Champion Carlos Mario has been on the planet, so remembers all the quirks in kiting design history. He took pleasure in reminding young pup tester Matt that when he first started kiting he used 40 metre lines, but that was because he was on a Flexifoil ram air kite and he thought the further he could get that kite away from the water, the better! But anyway, no such relaunch problems these days. The T5 is mid-level in terms of its presentation and features. The standard for modern kite design is reached through convenience and function with mid-sized inflation, reinforcements, good quality canopy cloth etc. etc. You’re not going to go wrong. The bar itself looks good and is designed tidily, but loses a couple of ‘full package’ points in terms of the final finishing touches that we might see elsewhere. In your hands the bar feels relatively thick, but with quite a soft rubber it’s very easy to grip lightly or tightly. We always find above-the-bar trimming cleats to work well, and this one works adequately (although on the water the kite is so well balanced that we didn’t have to use it at all!) Our only real note that you should be aware of is with the below-the-bar system. 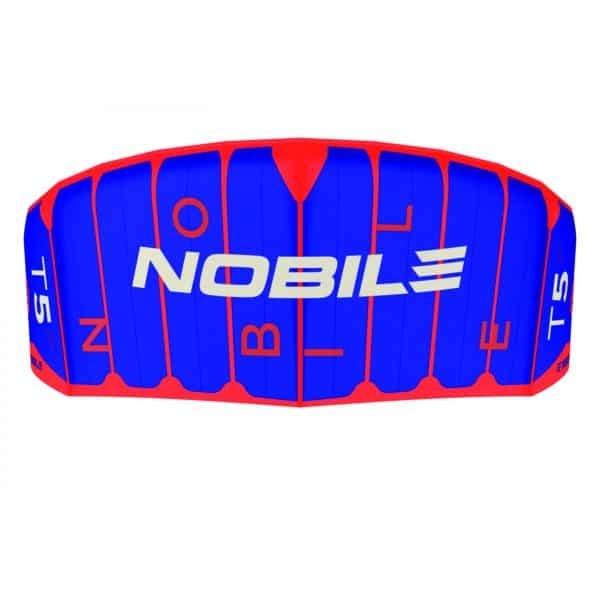 There are a few brands using this same moulded chicken-loop and push-away release collar. The tubing for the chicken-loop is a cheaper grade of plastic than you’ll find on some other brands, and although the actual process of pushing the end of the loop into the slot to re-assemble the chicken-loop after activation is straight forward (if a little clunky), the act of pushing the collar away to release it requires more than the average force of other designs. It does release, obviously, but practice to get used to it, though you should be doing that with any product anyway. 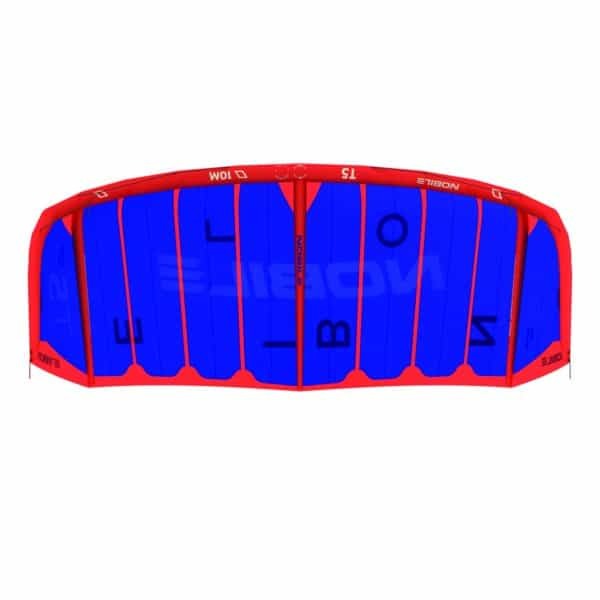 The more you shorten the lines on a small kite, the more it flies over your head, increasing the off-on power feel. 26 metres lengths are usually pushing the limits the other way in terms of reduced feel, but they truly worked like a dream on the T5, giving an immediate feel of poise, control and response at the bar. The steering speed is quick, but beautifully synced with the power in the kite, making it very intuitive. 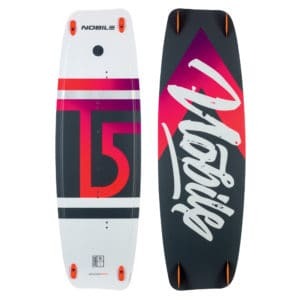 There’s enough turning speed for waves when you want it, especially if you switch down to 23s, but it’s not overly pivotal aiding smooth intermediate riding control, too. 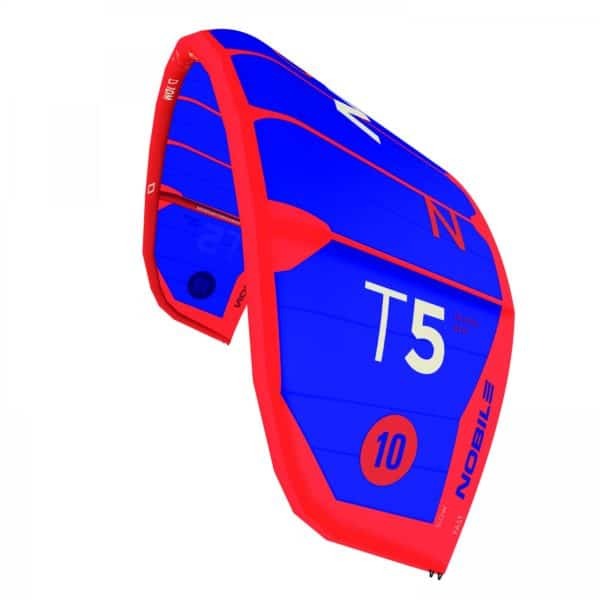 The first session we rode the T5 was probably the most brutal test session of the season, with massive gusts, and high top end wind speeds of well over 35 knots. From the moment we put the kite up we knew we were going to have a good time on it, though. The power delivery and control is delicious, like chocolate. There’s a constant pull and even in the big gusts the T5 just swallows it all up and you’re able to just feather the bar gently in and out to maintain board control. 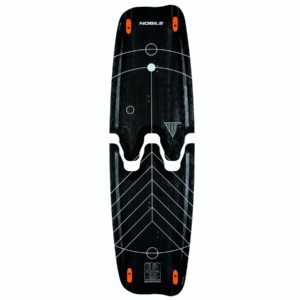 When it comes to jumping that extraordinary element of control means that even if you have huge amounts of power on tap loaded into the kite, your board speed and control remains very manageable, allowing you to approach your take-off in full control rather than skipping out. When you send the kite overhead and pull the trigger the T5 is pure class. It’s like, ‘Oh, you want to jump sir, well let’s go then.’ It starts climbing from the moment you send it. Shortly after take-off it’s like the kite latches onto extra lift that’s otherwise unavailable, like when a rollercoaster clicks into gear as it climbs uphill, but this is much smoother. There’s no clunking through the gears, you just go up, up, up and then you’re like ‘Oh, I’m still going up!’ The flight path is also so consistent with the hangtime being nicely proportioned with the height. You get time to really enjoy the flight because there’s total comfort from the sense that you’re being well looked after. Dropping down to the 23 metre line set-up will gear the kite up better for waves or carving around. The steering impulse will quicken, your downloops will be sharper and generally your one-to-one connection with the kite will increase. The smooth depower, power and silky feel and drive remain, but the shorter lines give you a little more zip in the waves. Personally, we think the option of 23 and 26 metre lines is fantastic, giving you a wide scope for performance. Any smaller and you start getting more specialised. Free 5-7 day delivery in Ireland. Customers should contact us via email or phone before sending the goods back to us. We will either offer a full refund or product exchange option.